It was originally called Englewood Cemetery in 1888, when it was started by the Southern Methodist Church, one year before Washington became a state. At some later date it was renamed Woodlawn which occurred after it was taken over by Corbin Park Methodist Church. "Deed signed to Southern Methodist Church on Nov 02, 1888, put on record Nov 23, 1888, book 1 pp#43. In 1895 sold for tax of $2.96, Mar 05, 1902 assessment of 1895 made by Karl J. Cook. Plat signed by members Feb 1897. 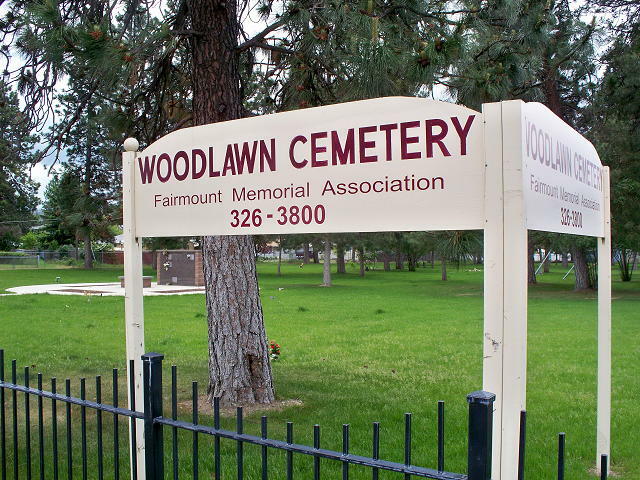 Plat book "0" page 23 at Spokane County Court House, it is called Woodlawn Park, no mention that it is a cemetery. Dedicated Sep 08, 1910. William S. Lewis, trustee. Witness: Carl W. Swanson. Lots are 16'x31.5' with 8' streets. Each lots designed to lay 16 to rest. Cemetery reportedly now belongs to Township. Original deed recorded by J.W. Woodruff." In 1998 the Edgecliff community took steps to fix up this long neglected cemetery, headed by SCOPE (Sheriff's Community Oriented Policing Effort.) Now in 1999 they are starting to mark all of the graves with grave markers, upon which has been placed the available information. Unfortunately upon so many, "Unknown" must be written. Wendie Kiourkas, heads up this cemetery restoration project, and she says over a year was spent searching in the courthouse and library records before they could continue. Since Woodlawn cemetery is now owned by the county, it is the neighborhood who must take care of it, and are doing so by donations and volunteer work. In about 2005 the Fairmount Corporation purchased this cemetery.